Project Phoenix was the SETI Institute's privately-funded research project to search for extraterrestrial intelligence which ran from February 1995 until March 2004. The name derived from the mythological Egyptian bird that rose from its own ashes – in this case, the ashes of NASA's High Resolution Microwave Survey (HRMS) which was canceled in 1993. After the demise of HRMS, the SETI Institute acted to retain the core science and engineering team of NASA's project and, with the aid of its subcontractors, upgraded and expanded the Targeted Search electronics and software. Project Phoenix was, at the time, the only targeted search for extraterrestrial intelligence in operation. Its core program involved examining more than 700 Sun-like stars within 200 light-years of Earth (see target stars), in the microwave window from 1.2 to 3.0 gigahertz, for narrowband signals that would indicate an artificial origin. The initial phase of the project, which ran from November 1993 to June 1995, involved making ready for use the instrumentation from the terminated NASA program and spending 5 months conducting observations of 200 Sunlike stars in the southern sky using the Parkes Radio Telescope in Australia. These observations were the first to utilize real time confirmation with an independent processing system and antenna. The Mopra 22-meter antenna, about 200 kilometers north of Parkes, checked any candidate signals detected at Parkes with a Follow-Up Detection Device (FUDD). At the conclusion of the Australian observations, the Phoenix receiving equipment, known as the Mobile Research Facility (MRF), was shipped back to California. There it was upgraded to improve performance, increase system reliability, and eventually allow automatic observing with little or no operator assistance. In early September 1996, the observing system was moved to the 43-meter telescope at Green Bank. 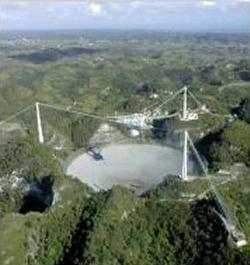 In mid-1998, it was moved again to the 305-meter Arecibo radio telescope. Each star on the target list was observed for about 1½ hours, during which time a multimillion channel receiver stepped across the1.2 to 3 gigahertz band in 10 megahertz steps, each observation taking about 5 minutes. Many signals were detected in each 5-minute period and their characteristics compared with a database of known signals from the Earth and orbiting satellites. Having eliminated known sources, a few were usually left which were then analyzed by FUDD. Parallel observations were made using the 72-meter Lovell Telescope in England which was equipped with an identical FUDD system. The use of such powerful and widely-spaced instruments enabled the quick and efficient discrimination between extraterrestrial signals and those which were local or due to satellites in Earth orbit. During a 3-week observation period each year, the two giant telescopes were trained simultaneously on the same target stars. If the instrument at Arecibo detected a potentially interesting signal, this information would be passed immediately to the FUDD at Jodrell Bank. The large spatial separation of the telescopes was sufficient to allow nearby signals to be distinguished from any that are coming from outside the Solar System. The observational phase of Project Phoenix ended in March 2004. The Targeted Search System was a transportable SETI system used in conjunction with existing radio telescopes for high sensitivity observations in Project Phoenix. It was composed of several subsystems, each responsible for one aspect of the signal processing. Among those subsystems were the Multichannel Spectrum Analyzer and the Follow-Up Detection Device. The Multi-Channel Spectrum Analyzer (MCSA) was the detector, together with its software algorithms, which was at the heart of the instrumentation used in the targeted portion of the High Resolution Microwave Survey and Project Phoenix. Developed at NASA Ames Research Center and built under contract to Ames by the Silicon Engines Company, the first operational version, known as MCSA 2.0, was capable of simultaneously analyzing 14 million 1-hertz channels. This represented a 10 millionfold increase in capability over the total of all previous searches. A Follow-Up Detection Device (FUDD) was a stand-alone subsystem of the Targeted Search System used in Project Phoenix and, prior to that, in the targeted portion of NASA's High Resolution Microwave Survey. It consisted of a box of electronics which intensively analyzed, at high resolution and sensitivity, any candidate signal that was picked up, while the telescopes involved in the search continued with their next set of observations. Identical FUDDs at the main antenna site and a remote antenna site enabled a signal to be confirmed as extraterrestrial in origin.